The badge of honour from the Association for Hot-Dip Galvanizing (Industrieverband Feuerverzinken e.V.) is awarded to personalities who, through outstanding commitment, have provided extraordinary and sustainable services to the hot-dip galvanizing industry. During this year’s general meeting held in Aachen in November 2018, Willi Kopf was presented the badge of honour by the Association for Hot-Dip Galvanizing, for his unparalleled entrepreneurial excellence and his many years of voluntary commitment. 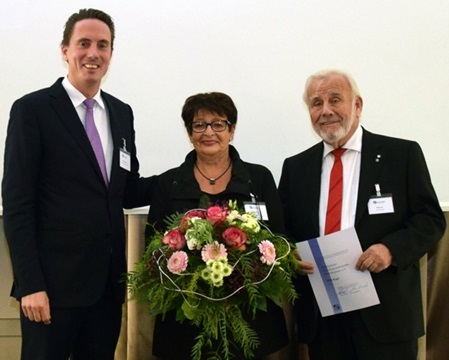 Willi Kopf has actively contributed to the association’s work for many years, acting as a board member and as the head of the regional group south, among other duties. The well-being and future of the association have continued to be a central concern to him, even after retiring from his active honorary involvement. He is particularly dedicated to the promotion of common interests of the supportive society. In his laudatory speech, Paul Niederstein, spokesperson for the board of the Association for Hot-Dip Galvanizing, also highlighted the fact that Willi Kopf’s wife Magda who tends to keep in the background, has contributed significantly to the Kopf Group’s great success.